HOW CAN I CHANGE THE LOCATION OF A VIRTUAL BUOY? 1. First, navigate to the region where you would like to receive a forecast by using the menu at the left of the page. 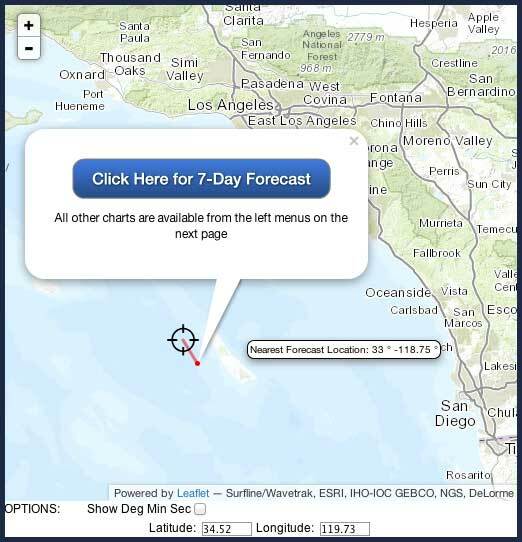 Once you have chosen a region you will be able to click on a forecast page to find the virtual buoy closest to your desired location. If you know the precise latitude and longitude for the location you would like to receive a forecast, you will notice latitude and longitude displayed below the map. You may toggle between decimal and degree-minute-seconds formats by clicking the appropriate boxes above the lat/long display. 2. If your location is not in the menus at all, click on the "custom location" link on the left navigation menu to pick a forecast location anywhere in the world.